Here is a glossary and explanation of various terms and charges which are often referred to or applied by car rental companies. This fee is charged in all cases of damage or theft irrespective of what level of waiver has been taken. Added explanation: This fee covers the administration costs of processing the claim and assessors’ fees. This applies when there is more than one driver. Note that all drivers must be listed on the applicable rental agreement. The Additional Driver Fee is not ‘insurance’ and applies in the event that an additional driver is required. If an unlisted driver is involved in an accident or theft of the vehicle occurs, the renter will be liable for the full damage and/or replacement costs. Added explanation: When additional drivers are involved, generally there is a significant increase in administration and vehicle retrieval costs, thus this charge. All airport location rental companies apply an Airport Surcharge on every car rental agreement check-out. Added explanation: The Airport Company of SA (ACSA) subjects car rental operators to additional rent charges to trade from these locations. Instead of applying these additional costs across all rates, they are applied to where the expense is incurred and are generally around 11% of the Time and Kilometer rates of the rental contract. Changes to a reservation must be done at www.Hertz.co.za using the "Modify/Cancel" option or alternatively via our call centre. Kindly note that any changes to the reservation may impact on the rental charges. If a reservation is cancelled within 24 hours prior to the pickup time, a cancellation fee equivalent to 1(one) rental day of the total rental will be billed as per the reservation confirmation. All segments – A Prepayment amount equal to 50% of the total rental value per vehicle may be required for 10 (ten) or more vehicles reserved at a time. The Prepayment amount of 50% is required 30 days prior to arrival via EFT or credit card as surety for the bookings. If cancelled within 21-30 days prior to check out - 25% of deposit paid will be forfeited. If cancelled within 14 –20 days prior to check out- 50% of deposit paid will be forfeited. If cancelled within 3- 13 days prior to check out – 75% of deposit paid will be forfeited. If the block booking is cancelled within 48 hours (2 days) prior to check out; then Hertz reserves the right to forfeit 100% (hundred percent) of the deposit paid. If CDW is declined, you must provide proof of insurance (i.e. a current letter from your Insurance Company) and be responsible for the cost of repairing or replacing the damaged vehicle up to the full value of the vehicle. An authorisation of the Total (local currency) value of car applies at check-out, in addition to deposit required depending on rental type will be blocked on credit card. Otherwise, the vehicle rental could be declined. In the event that a rental vehicle is requested to be delivered and/or collected from the renter’s venue of choice, a charge is applied. The amount varies per the distance travelled and generally, extra charges are applied after hours, on Public Holidays and over weekends. Added explanation: There are additional manpower and second vehicle costs incurred when delivering and collecting vehicles. A R1650 deposit for all credit card related rentals, is taken at time of rental for estimated rental plus an additional deposit for extras including a fuel deposit and 100% of the applicable responsibility. The minimum age for rental from Hertz South Africa and Namibia is 18 years. Added explanation: It is a legal requirement that Drivers License details are entered onto rental contracts. Drivers’ licences must be carried on all persons at all times whilst driving in South Africa. A fee for admin processing purposes, charged per fine/penalty/infringement incurred during the duration of the rental. Rates are calculated for a minimum period of 24 hours from time of pick-up to time of drop-off. A fee charged 24 hours after initial check out date of a confirmed reservation/contract, with no customer notification of cancellation. Most car rental operators allow one-way movement between rental stations within SA’s borders free of charge. However, there are instances when One-Way Rental Fees apply so always check with your reservation and/or renting location. Generally, vehicles may not be dropped off at centres outside the country’s borders. Refer to section on ‘Over Border Rentals’. Additional explanation: Sometimes there is a high one-way flow of vehicles into or out of a specific area and increased costs are incurred to move vehicles to areas where there is a demand. In these instances, one-way rental fees may apply so check with your rental company at the time of making your reservation. 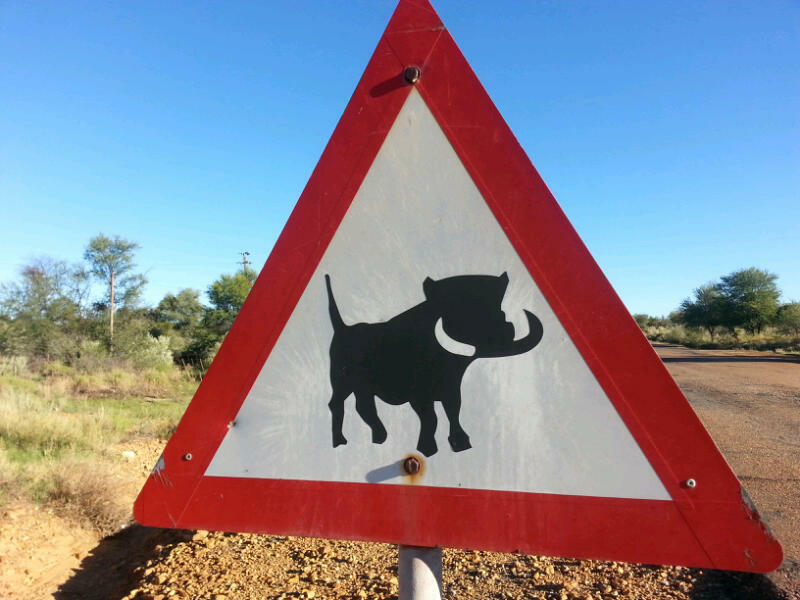 Generally, car rental companies do not allow vehicles to be driven outside SA borders. However, any renter wishing to enter a Neighboring Country must be in possession of a Letter of Authority from the car rental operator. Note that with most rental companies, for rentals originating in SA and driven into neighboring countries, the Waiver and Liability conditions of the country being visited will apply. An over border fee will apply. Vehicles entering Namibia, Botswana or Zimbabwe are subject to road tax, and may incur other entry charges depending on the regulations of each country. Petrol is excluded in car rental rates. Cars are delivered with a full tank of petrol and the customer is charged for refueling upon termination of rental. Fuel consumption is gauged from rental station to rental station. All rentals are calculated and charged per day(24 hours = 1 day). Late returns will result in a late return charge of a whole extra day. Most car rental operators apply a once-off Rental Contract Fee per rental agreement. Added explanation: There is a legal requirement to store documents for a period of five years and the cost of administering, storing and retrieving documents necessitates an amount be charged per rental contract. Most car rental companies apply a fee which is charged in the event that the car rental company receives a traffic fine, incurred by the renter but not settled by the renter. It does not replace the fine amount which the renter must settle directly with the relevant traffic authority. Added explanation: Due to the administration and additional information required by the new NATIS Traffic Fine System and the traffic law enforcement authorities when handling traffic fines, this fee covers these expenses accordingly. A fee charged only for any car on termination showing full on fuel gauge. A 1% fee based on the Time and Kilometre charges is payable by all car rental companies. Added explanation: Airlines, hotels, car rental operators and other travel and tourism-related industries contribute to a Tourism Marketing Fund administered by Government and Business (Tourism Business Council of SA). This is charged to the renter and passed on in full to TBCSA. In the event that the interior of the vehicle has been soiled or marked, a fee for Valet cleaning will be charged accordingly. All charges reflected on rates’ brochures and website rates and tariff pages are inclusive of government’s 14% VAT prior to 1 April 2018. VAT will increase to 15% as of 1 April 2018. Waivers are offered to the renter and, if purchased, reduce the renter’s liability/responsibility for costs relating to accident damage and/or theft (in full or partial) to the rented vehicle. Values of the waivers offered differ according to the type of vehicle and according to which level of waiver (eg. Standard Waiver cover or Super Waiver cover) is requested. The renter should note that even with the purchase of a Waiver, in the event of an accident or theft, generally there is an amount for which he/she is liable. This is often referred to as the renter’s ‘Responsibility’. Should the waiver options be declined, the renter will be held liable for the full costs in the event of accident damage and/or theft. Breach of terms and conditions of the rental agreement will also render the renter liable for all costs in the event of accident damage and/or theft. These are rentals which are checked out on a Friday, Saturday or Sunday for a minimum of two days and maximum of 4 days, but which are not returned later than the Monday following the check-out. Added explanation: Car rental risk trends indicate a higher volume of accidents and theft-related incidents of weekend rentals. The industry philosophy of charging where the expenses are incurred applies hereto. Herewith a few important issues to remember should you be involved in an accident or any kind of incident. Notify Hertz, the Renting branch or your closest branch within 3 hours of becoming aware of the occurrence. All incidents must be reported to the police within 24 hours of the occurrence. Windscreen and tires claims need not be reported to the police. A Claim form must be completed and submitted to Hertz within 24 hours of the occurrence. A copy of the driver’s ID and licence must also be handed in together with the claim form. Please ensure that you furnish Hertz with the detail of the Third Party in the event that a Third Party is involved in the incident. The ID nr, address and contact number of the Third Party is required. Names and addresses of everyone involved and of possible witnesses must also be provided to Hertz. The Renter must not admit any responsibility or liability in any incident. Please do not abandon the vehicle. Ensure that the key to the vehicle is always in your control. Towing of the Hertz vehicle must be authorised by Hertz. Details of other party or property, this is extremely important as we need to do a recovery in the event of a Third Party claim where the incident was the fault of the Third Party. Please refer to (familiarise yourself with) the Terms and Conditions of the Rental Agreement. Having trouble registering or downloading your invoices? Follow this step by step guide to improve your Hertz online experience. Making a profile is quick and easy. Click the "Register Now" link in the upper right-hand corner of the page. Simply enter the requested details and hit Enter. 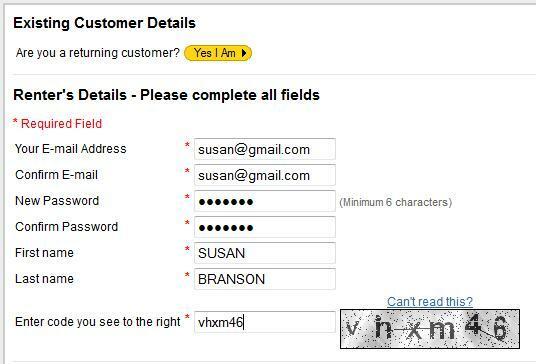 To speed up the checkout process at the counter, please add your Personal Details. If you are booking for a Corporate/Travel Agent/Wholesaler on account please fill in the fields below (one per account). If you are loading more than one, just click "New", and if you would like to remove one, click "Delete". 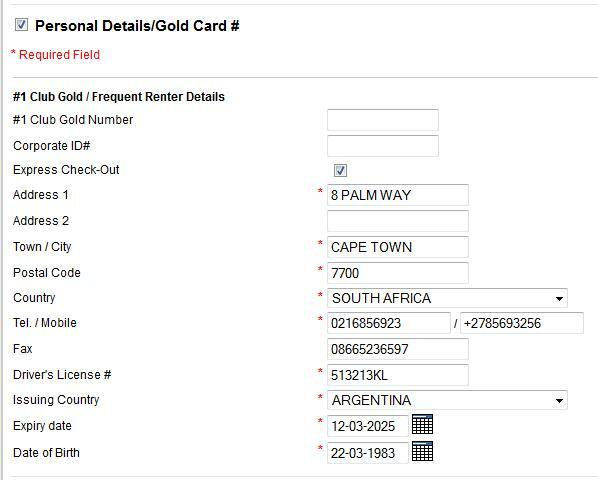 When making a reservation, you would select the account from the drop down menu under "Billing". You are able to download your Rental Agreement, Invoice, Statements and Management reports if you have the account numbers loaded in your profile. Enter your Reservation #, Rental Agreement # or get your list of Transactions. Select which transactions you would like to see. You will then be able to view, edit or print the results.